Spice up your favorite drinks and dishes with the zesty taste of Clamato. 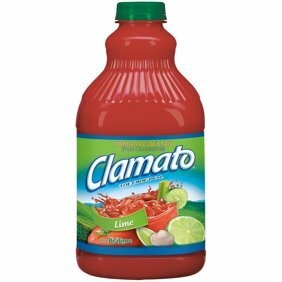 Clamato Picante is an authentic, invigorating blend of tomato juices with an extra kick of spices. There is plenty to share in this 64 ounce bottle, perfect for enjoying by itself as a refreshing juice alternative. It mixes great with beer, vodka and other spirits making it ideal for classic drinks like The Perfect Michelada or a Bloody Caesar. Picante keeps the party going into the kitchen where it adds zesty heat and delicious flavor to hot and cold dishes and is perfect for grilling seafood, meat, chicken or making salsa for tacos. Versatile and essential for any occasion, keep life spicy with Clamato Picante. Instructions: . Shake well. Serve chilled. Chicken Wings with Clamato® Spicy Sauce! Mix in a saucepot 1½ cups of Clamato® Tomato Cocktail Picante, 2 tablespoons of tomato paste, ½ bunch cilantro, chopped fine, salt, cumin, and onion and garlic powder to taste; cook 10 min. Combine this sauce with 3 lbs of chicken wings previously grilled. Spicy but not hot! Very tasty and the price is a lot cheaper on walmart.com than anywhere else that I have found. I have yet to find it at WalMart stores so I always order it online. Once used to Picante, I liked it better than Original. Both great. I wish they made smaller bottles so they would easier for older people to hold. Great to drink. Great to cook with. Not only is Picante great to drink. It makes the best Bloody Marys and is awesome to cook with. Just cook some shrimp in the Picante and serve over angel hair pasta. Its that simple. No added seasonings needed. Give it a try sometime. You won't be sorry.